There was more boom and bust (mostly boom really) in the undersea cable industry around Africa. Of the LiquidSea cable announced in 2015, it was still in the news in March 2016 but nothing concrete appears to have happened. In the same month, OmanTel announced the Gulf to Africa (G2A) consortium, consisting of Omantel, Ethio Telecom, Golis Telecom and Telesom. G2A is planned to connect Oman to both Somalia and Ethiopia. It will consist of a 1,500km undersea segment and a 1,500km terrestrial segment offering a capacity 20Tbps. The initial announcement dated completion by Q4 2016 but it appears to still be a work in progress. The ACE cable extension from Sao Tomé & Principe to South Africa announced in 2015 also still seems to be a work in progress. Construction began in April 2016 on the South Atlantic Cable System (SACS) which promises to be the first direct undersea link between Africa and the Americas. April also saw the announcement of the Africa-1 undersea cable, yet another consortium, made up of MTN, PCCW Global, Saudi Telecom Company (STC), Telecom Egypt (TE) and Telkom South Africa. Africa-1 is planned to run 12,000km along the east coast of Africa towards Egypt, Saudi Arabia, and finally Pakistan. Cameroon’s announcement in 2015, of the Cameroon-Brazil Cable System (CBCS) linking Cameroon and Brazil has changed names and become the South Atlantic Inter Link (SAIL) cable. This project seems to have solidified with a Construction and Maintenance Agreement having been signed in August 2016. Mauritius also has plans for expanding undersea capacity through a partnership between Seacom and Indoi to build a new telecommunications cable system to connect Mauritius to Africa. An MOU was signed in Nov 2016 and the cable is slated for completion in late 2019. Globalcom announced plans for new landing stations for their GLO1 cable in Côte d’Ivoire, Gambia, and Senegal. Almost unbelievably, another East Africa undersea cable was announced. The Djibouti Africa Regional Express (DARE) cable is a 5,500km cable which will connect Tanzania, Kenya, Somalia, Somaliland, Yemen, and Djibouti. The Africa Africa Europe (AAE-1) undersea cable completed its first phase of construction in October of 2016. Last but not least, EulaLink cable, announced in 2015, is now the EllaLink cable and will connect Brazil with Spain and Portugal, connecting up Cape Verde and the Canary Islands along the way. This project still appears to be active although no formal announcements have been forthcoming. Compared to the previous two years, this is a staggering amount of new, planned capacity. It is hard to imagine demand that will grow to match this investment but with the rise of streaming media and video on demand services on the continent, it is not impossible. One thing is certain, it is good news for the consumer. More undersea capacity will continue to stimulate investment in terrestrial networks and create more competition. Investment in terrestrial fibre networks has also grown on the continent. Last year I tracked 19 fibre project announcements referencing a total of 730 million dollars of investment in over 22,000km of fibre. In 2016, those numbers increased to 26 announcements totalling 5.3 billion dollars of investment covering a proposed 60,000km of fibre. You have to interpret those numbers with a grain of salt as fibre projects are sometimes re-announced after each phase of development and sometimes announcements do not always match reality. The totals are derived from news announcements in 2016. What we can interpret is that investment in terrestrial fibre infrastructure in African countries is still on the rise and shows no sign of slowing down. As in previous years, the World Bank, African Development Bank, the Chinese feature heavily as investors. Huawei seems to win a large proportion of the contracts to deploy fibre networks. The significant exception to this is in West Africa where French firms seem to be having some success. Liquid Telecom continues to expand across the continent, forming a joint venture in 2016 with the Botswana power utility. Another trend in 2016 was the increased entry of power utilities into the broadband market. Not just the Botswana power utility but utilities in Kenya and Uganda as well. An interesting potentially large terrestrial fibre network was mooted in August of 2016 by the ministers of Algeria, Mali, Niger and Chad. They discussed the possibility of building a Trans-Saharan fibre optic cable. Somewhat surprisingly, I did not see a single announcement in 2016 of a new metropolitan fibre optic network. This is probably because a lot of metro fibre build out is being done by network operators in course of their network investments. Still I expected to see more dedicated Open Access metropolitan fibre networks. On the other hand, there were plenty of FTTH announcements with South Africa and Kenya leading the way. Much of the FTTH investment is intended to serve the growing Video on Demand market. The biggest news in 2016 was the launch in January of Netflix across the continent. The arrival of Netflix has meant that African streaming and VoD services now have to offer a clear value-add whether in differentiated content or price or quality of service. Nigeria’s iROKOtv followed up the Netflix announcement only a few weeks later with news that they had secured 19 million dollars in funding to expand their services. Liquid Telecom launch VoD services in Zambia and Asian streaming media giant iFlix announced plans to expand into Africa. There is a sense of a land rush to gain pole position in offering OTT services on the continent but many of these companies may be challenged to grow fast enough given the twin challenges of availability of broadband and ability to pay. LTE networks continue to expand across the continent with roughly the same number of new network announcements as last year as well as announcements of LTE network expansions. 1800MHz and 800MHz continues to be the dominant choice for LTE networks: 1800MHz because this is spectrum that most mobile network operators already have a license for so they don’t have to wait for new spectrum to be released by the operator; and, 800MHz because this spectrum is either being re-purposed by former CDMA operators with licenses in this spectrum or because the spectrum was empty to begin with. The one big change that can be see this year is the increasing diversity of frequencies that are being used to deliver LTE services. 2016 saw launches in no less than eight different LTE bands. This becomes a challenge for smartphone manufacturers. Expensive, high-end smartphones are designed to support a wide range of LTE frequencies but for inexpensive smartphones that sell at $50 or less, the range of support is much smaller. This may amount to a kind of network lock-in for the poor who may not able to afford a new phone in order to switch networks. LTE-Advanced (LTE-A) networks saw their first deployments at scale in South Africa and Gabon offering speeds two to three times faster than regular LTE networks. Somaliland SomCable Launch 2016-01-17 LTE 700 ? ? Gabon Moov Launch 2016-12-01 LTE-A ? ? ? Congo MTN Launch 2016-12-14 LTE ? ? ? Another feature of 2016 is that, for better or worse, spectrum auctions seem to be taking hold on the continent as the dominant means of assigning high-demand spectrum frequencies. 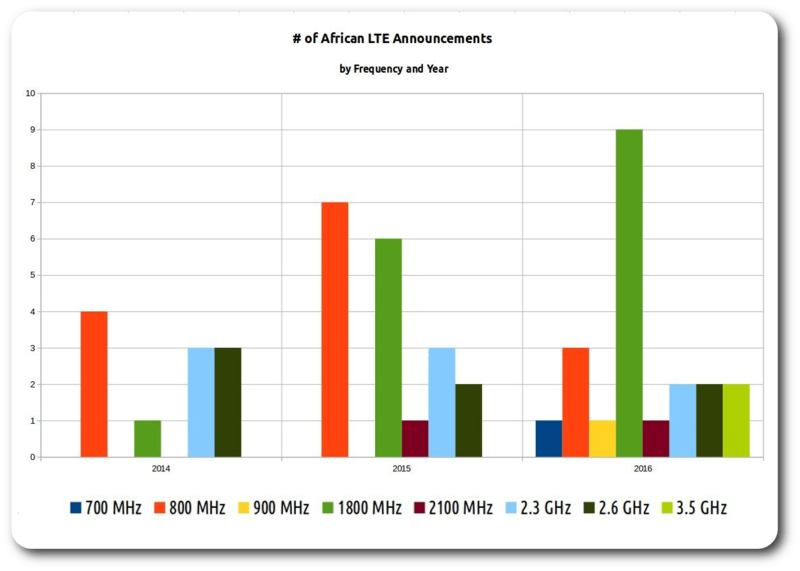 I have written more extensively about recent spectrum auctions in Africa so won’t go into detail here. It is enough to say that I am far from convinced that spectrum auctions are a great idea in general but especially in Africa. They are difficult to organise effectively and expensive to run both in time and money and often don’t turn out the way they are planned. Certainly Ghana’s experience with 800MHz spectrum in 2016 in which MTN was the only successful bidder cannot be considered a success. Kenya managed to assign 800MHz spectrum without an auction. South Africa continues to be mired in a three-way battle between the telecommunications ministry, the regulator and the operators with no end in sight. Finally, Egypt appears to have effectively forced all the operators to buy spectrum at an egregious price. Extracting too much value from spectrum licenses may end up killing the golden telecom goose. Egypt 22 Oct 2016 Vodafone loses most after redistribution of 4G frequencies among companies. Egypt 26 Sep 2016 Egypt considers international 4G auction after telcos reject licence terms. Egypt 16 Oct 2016 Egypt completes long-Delayed 4G mobile license deals. Ghana 18 Mar 2016 Ghana looks to spectrum sales to fund digital migration. Kenya 27 Mar 2016 Major telcos to share 4G frequencies with smaller firms. Kenya 26 Jun 2016 Top three mobile operators to pay Sh2.5bn each for 4G licence. Kenya 11 Aug 2016 Safaricom to slap State with Sh9bn bill for security network. Nigeria 21 Apr 2016 Bitflux Begins Commercial Rollout of 2.3GHz Services. Nigeria 20 Oct 2016 The Untold Story of NCC’s 2.6GHz Spectrum Auction. Senegal 19 Aug 2016 Sénégal : Les détails de la nouvelle convention de concession d’Orange sur Sonatel dévoilés. Senegal 19 Jan 2016 Sénégal : l’appel à candidature pour la 4G est ouvert à de nouveaux opérateurs. South Africa 9 Oct 2016 ICT white paper under fire. South Africa 6 Sept 2016 Spectrum meltdown. Perhaps the most profound impact of the spread of terrestrial fibre on the continent is the manner in which it is enabling alternative last mile access in an environment where the last mile has been controlled by those with access to licensed spectrum. Unlicensed (WiFi) and dynamic spectrum (also known as television white spaces spectrum) are now coming into their own as terrestrial fibre networks offer the enabling backhaul infrastructure. Of the two, dynamic spectrum has moved more slowly in 2015 as we wait for manufacturers to scale up manufacturing of dynamic spectrum chipsets. There is an unfortunate Catch-22 where communication regulators are waiting for signs of large-scale manufacturing to move forward with dynamic spectrum regulation and manufacturers are waiting for clear signals from regulators before scaling up manufacturing. I had hopes that South Africa or Malawi might have formalised dynamic spectrum regulation in 2015 but it seems that this will likely happen in 2016. Progress in the form of new dynamic spectrum pilots took place in Mozambique where a new startup has been given permission to deploy TVWS infrastructure and Morocco where a pilot was launched to connect schools in rural areas. What stands out in 2016 is the ongoing investment in fibre optic infrastructure both undersea and terrestrial. Clearly investors envisage a massive uptick in broadband demand on the continent, which is likely to be driven by the uptake of streaming media services. There is a kind of scramble for Africa feeling about fibre infrastructure and streaming media where companies are rushing to stake their claims. But this scramble is more diverse with both international and African investors looking to achieve first mover advantage in markets across the continent. Fibre is also changing how we think about spectrum. It has the potential to democratise the last mile by allowing multiple last mile service providers using various access technologies to compete for customers. This seems like a very good thing but spectrum regulation will have to catch up to these changes in order for that to be fully realised. LTE networks continue to grow but are still generally limited to urban areas where both people and wealth are concentrated. The high spectrum fees we are seeing for new spectrum through spectrum auctions or otherwise are unlikely to encourage operators to deploy networks into rural areas where delivering a return on investment is likely to be slow. Finally, 2016 also seems to be the year that WiFi really came into its own as a legitimate access technology on the continent. Demand for broadband, the spread of fibre, and the proliferation of WiFi-enabled devices from smartphones to tablets have all contributed to this. Back in 2012, I lamented the lack of attention that WiFi received, especially from the UN Broadband Commission. That’s all changed now.